The US civilian aircrafts are expected to observe China’s rules in its newly-declared air defense zone in the East China Sea. A statement said this did not mean the US accepted China’s requirements in the zone covering territory claimed by China, Japan, Taiwan and South Korea. China wants all aircraft there to file flight plans and identify themselves. The US, Japan and South Korea say they have flown military aircraft in the area unannounced. But China said it scrambled fighter jets on Friday. The move was to monitor US and Japanese aircraft in the zone. The air defense identification zone (ADIZ) covers a vast area of the East China Sea, including a group of islands claimed by Japan, China and Taiwan. 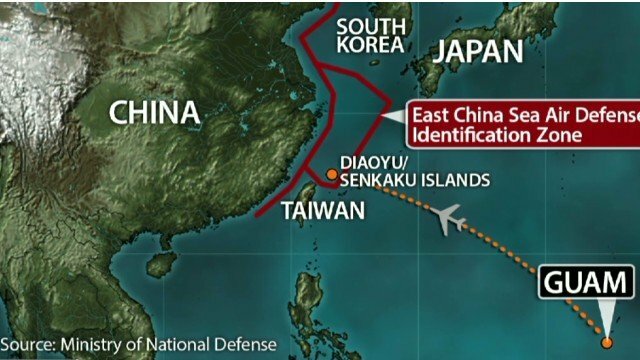 The establishment of the ADIZ has caused widespread anger, with the US state department calling it “an attempt to unilaterally change the status quo in the East China Sea” which will “raise regional tensions and increase the risk of miscalculation, confrontation and accidents”. However, on Friday, the state department said the US government “generally expects that US carriers operating internationally will operate consistent with Notams [Notices to Airmen] issued by foreign countries”. Japan has instructed its aircraft not to observe China’s rules. But a number of regional commercial airlines – including Singapore Airlines, Qantas and Korean Air – have said they will comply. China announced on Thursday it was deploying warplanes in the area for surveillance and defense.